Light pink sweater | Outfits - Do You Speak Gossip?Do You Speak Gossip? For this outfit, I combined my 2 latest purchases: this light pink sweater which is making its debut on the blog today, and my new Betty London ankle booties. Once again I paired pink with gray, a combination I really love, and went for coffee with my fashion blogger friends. A statement necklace was the perfect finish to this rather casual outfit. These photos were taken just before it started raining again, and this sweater and my coat (not pictured) kept me warm for the day. What do you think? P.S. This is the top and necklace I was wearing when I re-introduced myself to you, by revealing my real name, on this post. Have you read it yet? Were you surprised or were you one of the few who got it right? Well, if you WERE surprised by that revelation, get yourselves ready for an even bigger one really soon. Can you guess what could it be? Πολύ μου αρέσει αυτός ο χρωματικός συνδυασμός! Εγώ έπεσα έξω στην πρόβλεψή μου, αλλά το όνομά σου μου αρέσει πολύ-πολύ! Η επόμενη αποκάλυψη???? Χμμμ… Λες να έχει να κάνει με τον Τ??? syros2js recently posted..ΩΡΑΙΑ ΙΔΕΑ ΕΙΧΑΤΕ!!! Noooooo d exei na kanei me ton T..
Φιλιά και στους 2 σας! xixi Elpizw na min mas parexigises…Plaka kanoume…! Apla o T. einai akoma pio ntropalos apo mena se merika themata! 🙂 Poli sintoma tha sas apokalipsw auto pou grafw! Christina recently posted..Jewelry Workshop: Day 12! Cute sweater, I think pastels were made for you to wear! 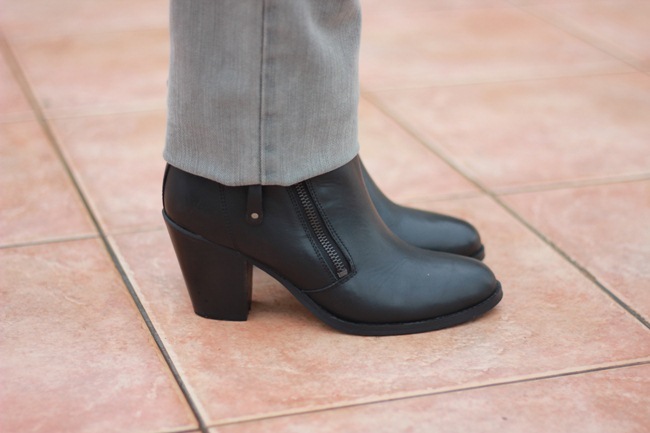 The booties are great for the season, pretty sure you’ll get the most out of them cause they are so versatile! i really love how this pink goes with your hair – perfect combination m! αυτο το κολιε το αγαπω! S’euxaristw poli! Eipame na mpoume pali se klima Xristougennwn siga siga, kai oi nifades voithane! Well, I love pink and matching with grey, so I loved your outfit! I also loved the necklace, I think it’s really very beautiful and outstanding! I really think you are very elegant, and anything you wear turns to be beautiful! 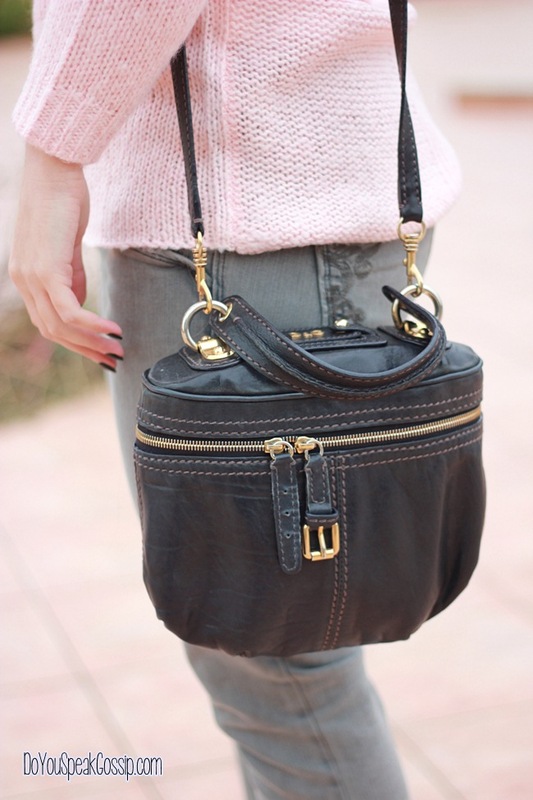 This outfit is casual chic! You always look great! Makia! Aww you always compliment me on my style. Thank you sooo much! I really appreciate your support, and I’m always really happy to hear that you liked my outfits! Thank you! Όπως πάντα υπέροχη !!!! !Εγώ ένα έχω να πω μόνο ………..keep styling!Γιατί υπάρχουν πολύ λίγες γυναίκες που ξέρουν να στηρίζουν σωστά ότι και αν φορέσουν και εσύ είσαι μία από αυτές!! !Για την νέα σου αποκάλυψη εγώ μαντεύω ότι θα μας δείξεις το πραγματικό σου πρόσωπο.E??? ?Έπεσα μέσα ? That’s a super cute sweater 🙂 You look great in that color. Kiss & Make-up recently posted..Giveaway | Win a Covergirl Styling Bag with five Covergirl products!